Now as to whether any of Dragams work will affect anything else is some what subjective so I wont respond to that. Let me just say that maybe the word RESTORE would be a better use. Yep this is what I was trying to convey, no video signal enhancing with these upgrades, Mikes mods do that. Just the control of the scan lines to the tube face is all thats helped out, which is not the same. Now for the record, let's stay clear that I'm not saying what you're doing will not make image quality changes. I'm saying that it will not effect the Mikrons. I can say that because I've also capped boards and like I said before, the perfect example of what I've been saying here is right there in Williams setup. he has a Marquee that once belonged to Mark Hahlich, that is very heavily capped everywhere. well no he doesn't. those boards were replacedwith Ultra versions that are stock. The was not an Ultra, but simply a 9500LC, with about half its boards Ultra. The upper motherboard, focus/geometry module, and all 3 boards mounted on the rear heat sink were not Ultra level boards, but everything else was. I replaced the non-Ultra boards with Ultra boards I bought off the Internet. Mike made some improvement mod in the Ultra focus/geometry module, but otherwise the new Ultra boards were unmodified. This finally coverted the right projector to a full 9500LC Ultra. 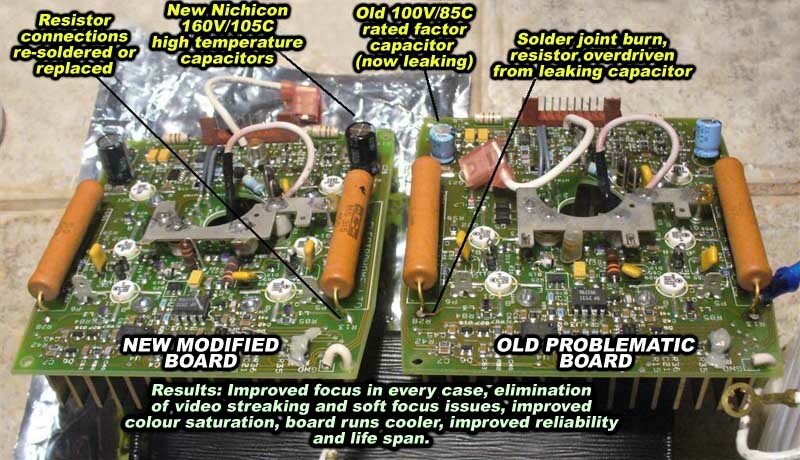 Ironically, with respect to the focus/geometry module and the 3 heatsink mounted boards, I went from orginial 9500LC boards with newer higher performance capacitors to Ultra boards with stock factory capacitors. Well I wasn't named as a requested respondent but I'll give a limited opinion. What MP is trying to say is that Dragams work will NOT affect the video signal. YES, I GET THAT. I'm not talking about the video signal. I was never talking about the video signal. I don't want to talk about the video signal. I'm talking about the image coming out of the tubes but it seems we're all destined to flog different ends fo the same horse. oh no, you don't just get to jump in and make a comment and then leave. no mcgyver it wouldn't. I used to restore cars and it involves bringing the machine back to original condition. You have no idea what I do and I'm getting tired of explaining this over and over again. It's not a restoration because I upgrade 130 parts, why is that so hard to understand? Is everyone around here a little slow? It's rahter funny Nasn that your the only other person i know who has actually worked on the other boards to this extent and yet everyone else is an expert on what this work will or will not do. Despite the fact that MP has "changed caps in other locations" no one not one of the posters in this thread has replaced the 130+ parts on the FDC modules. Oh well, I wasn't really expecting a resolution to this since everyone tends to keep repeating the same old info and it desont matter whether your 5 or 500 pages into a thread . MARQUEE HD MODS: Bring your Marquee CRT projector (or clone) back up to spec and offer even greater performance! Hell I'll piss off everybody and send you my boards for SPITE if this keeps up. Firefly rules. Can't stop the signal. Drangan what you and I are doing is called P.O.O.G.E , Progressive Optimization Of Generic Equipment. There is a set of excellent articles about doing this to audio gear and digital DAC.s etc, this principle can be applied to almost any electronic gear Audio or Video. and I am going to try them on the FCM and other locations where i can find suitable replacments. HK Steve sells his mods over in Europe and he does what you do dragan but right down to the SMD cap level, his customers are all extremely happy . Now were a little slow, eh? Well lets see. Restore means relacing old parts with new parts of equal or better then original quality. Doesn't mean it will preform any better then the original, when it was new. Sounds like what your doing. Now, since you asked....... will using better quality caps when restoring a board make it preform better then when original? NO!!!!!!! Changing a cap to a higher value because an original was undersized is a different story. Will a board preform better after you replace a bunch of caps? Only if there was a problem with any of the original caps. Can a board be modified to preform better then the original. Yes, but not by upgrading caps. Will your work make a board last longer? Maybe.......As far as caps go maybe but there are still hundreds of other parts to fail but thats another discussion. So, my response is.......if someone sends you their boards that has failed or weak caps.......then yes...your work will help that. Why don't you split all of the replies off into its own thread? As Dragan mentioned it's likely that comments will continue here regardless of what we do, which is probably completely true. I forgot about that. Someone will post a question to Dragan and I'm sure someone other than Dragan will feel that it's their place to post a response about what his service does or doesn't do. Case in point: I've mentioned to some of the contributors of this thread that this isn't the right spot to post certain comments or suggestions and after they agreed they still came back a few weeks later and continued doing the same thing. I don't have time or interest to monitor and babysit what people do in every thread on this forum unfortunately. No offense, but you and Dragan should have discussed this with MP before this came up. His name was brought into the discussion and he should have a right to reply to those comments. Anyway, you could split the thread and lock it. Also, why did Dragan not get his own forum? I wouldn't reply on the tech aspects of this thread, as I will leave it to others. One thing did come to my attention. 2) if it can't, then how can this noise possibly not affect the image quality being projected on the screen? Scott is a really nice and humble guy, so I doubt he would jump in on this. To me, it sounds like you are criticizing his work here. If it was this bad, then wouldn't it have been seen in other installs were they are running high resolutions or in his lab? I agree Scott, will not come to this thread, and if he does it would be just giving some tech knowledge and leave it there for us to absorb . Although you have to remember he was not on the original design team for lots of these boards and has just recently done work on the VIM and a new VNB design due to the fact that the old Motorola transistors are no longer available. IIRC he even mentioned to me in some PM's about the choices of the original designers but even he is still learning why they did things the way they did and sometimes they may have gone in a better direction. But as a side note he has helped me out quite a bit with issues i have come across and no amount of thanks can be said enough to convey my appreciation. yuor contradicting yourself, but at least some are turning on. Yes, the original caps were un undersized in many locations. Second, how can a 13 year old undersized capacitor possibly be running at the correct specifications, it can't. With the CVA in particular every single machine so far is showing some signs of swelling in the blow-out safety top. well i'm glad you cleared that up, up till now that tired old Mantra has been repeated only about 2 dozen times so far. Why is it so hard for you and Mike to understand that The only relevant information is people with and without the MP video chain are seeing an improvement in the PICTURE QUALITY after having the other boards upgraded. Why is that so difficult to grasp, it's not rocket science? No offense, but you and Dragan should have discussed this with MP before this came up. His name was brought into the discussion and he should have a right to reply to those comments. ? hi Mike, I can't believe it's been 3 months since we talked about upgrading my 03 VIM. I got really busy, Anyway, I am still planning on getting it out, just waiting for sales to slow down. I had a question for you, I know you've been in this business for a long time and I wanted your opinion on this. Good thing, bad thing? Will I be regretting this shortly? Hey, this is GOOD. Thie is also something that I did not offer. As you indicated, it's what an older or aged marquee would need to stay in the game, so yes, you should go forward with this because it is a must. A lot of the problems I was getting from some of my mods were from the areas that you intend to address. So I too can send folk your way.. There may be a few other components you can also include, so I'll have to get back to you on what they are. This is a NEED - so DO IT! Anyway, , why did Dragan not get his own forum? Kal suggested and I agreed that the CRT hobby is so small that having a new forum was not necessary. It's proven to be true, I do about 2 sets of boards per month, which is perfect for the summer when I actually like to go to this place called "outside" and focus on things that are farther than 2 inches from my nose It's also about a hundred bucks a month which goes to the forum, something all the blowhards in this thread don't really seem to value based on their remarks. WHOA Ham, your making a huge leap here. the Marquee CVA was designed in 1995 by Electrohome Canada. That board has NOTHING to do with Scott. AAMOF, as Nash has pointed out, Scott himself has pointed to this board as a problem area. Please, there is so much crap in this thread already, lets not jump to false conclusions. thanks, I'll check it out. the power supply's is one area that a lot of gains can be made based on remarks from just about everyone but I just don't have the time to go there. Maybe it's time for a Supernash LVPS? No contradiction here. Thats exactly what I stated. If they were originally undersized in value based on the design of the circuit then they could fail prematurely. You then post that they are. If this was a tech discussion I would now ask what you based your opinion on that the originals were undersized and exactly which ones you believe are and what your replacement choice is. However I have no desire to continue this conversation because I have no desire to condemn anything you are doing. I would be much happier supporting what you are doing. This can only be accomplished if you stop responding negatively to comments in here. I will stop responding right now if you do, OK? So let me finish on a good note. I SUPPORT WHAT YOU ARE DOING!!!!!!!! Ok, I'll give this one more try. I've asked for anyone out there who has a good to solid understanding on this to respond to this and help me to understand HOW it is remotely possible for basic cap changes to be made to the boards that you mentioned earlier in this thread to make the changes that you claim, and the only person that did chime in on your defense is Athanasios... So far the only person (macgyver655) I know of that is qualified to chime in has disputed your claim. So let's just sit back and wait for someone to support your claims technically. I have a 1996 Electrohome 9500LC, currently at 4000 hrs on original tubes with Mike Parker ‘Micron’ mods (-03VIM & NB’s) installed in January 2009. For a while, I have been considering Dragan’s Marquee HD board modifications mostly from a reliability and stability standpoint for my aging Marquee. I was not really looking for further PQ improvement, as I have been very pleased with the image quality from MP’s latest mods. However this month, I had Dragan go ahead and update the deflection, focus, Stig, and convergence circuitry (5-boards). Upon re-installation, I was presented with a noticeable sharper focus and more 3-dimensionality, better resolution of detail in both the foreground and background, and silky smooth images with reduced noise in the picture overall. Furthermore, the picture seems more transparent, like a thin layer of film was removed when looking through a glass window. Blacks seem blacker, shadow detail more defined and color saturation more intense. This is all discernible with scaled video, but when viewing a native HD source these improvements really standout. It’s funny many of the same improvements I noted after installing the MP mods have been further enhanced upon with Dragan updates. So, in terms of value, it’s a winner for the improvements yielded in picture quality, and the rear heatsink definitely runs cooler after the upgrades to the boards, another good benefit. I highly recommend Dragan’s Marquee HD modifications, his soldering work is top notch and his turn-around time was excellent, I had the boards back in the projector in less than a week. Once installed, only a minor touch-up of convergence and greyscale tracking was required. So like I said before, whether or not you have the MP video chain, you are not seeing your machines full capability until you do something about the Focus, Deflection, and convergence circuitry. Either that or go and get one of those New in box Longbows. I would like for another known expert in this to please convince me that this is remotely possible.......please? If input boards are high hour you might see some difference by chancing bipolar elcaps from input boards. Chancing caps won't make picture sharper, there is needed to chance also transistors and modify peaking circuits etc. That is very time consuming and good test equipments is needed. Modifying boards power lines filtering using bigger caps and inductors can make noise level lower. This is already done to 808[b]s input board in factory. I changed a few hundred caps in my old BG800 that had about 24,000 hours on it at the time. Changing the bipolar's in the video input card did wonders for the colours. It was like a grey veil was lifted. The colours were considerably better. Didn't have a colorimeter at the time but it would have been interesting to measure the before & after primaries. Changing the other caps (mostly the big SMPS ones) greatly improved convergence stability but it did nothing for the image quality/sharpness. In fact, caps won't help your sharpness. Changing the input caps won't help the noise problem but changing the PS caps on the 2 boards might. DOn't worry about screwing up the caps, just remember to get them in polarity correct. You can go a little larger in value but try to stay close to the same voltage ratings. Let me be clear what i was saying here. As seen in the quote, this was related to "PROBLEMS" I WAS getting. And those problems were caused from caps needing replacement in the LVPS and HVPS. No where dii I, ore would I had said anything as to it improving on what I'm doing, because in no way would that be the case. So to be clear, this was referring to cap replacement for those same caps that I had also mentioned in the MM thread. Nothing at all about performance. Yep, for Problem set ONLY. The ones that had leaking caps in the LVPS and HVPS. And what is there to be insecure about? When you made the claims that you did, to me it's like saying changing your old worn out antifreeze to Prestone Gold antifreeze will make your car perform better. And the antifreeze change would also increase your gas mileage and make your car go faster. OK, let's be clear here. where did Scott refer to this board as a problem area. I've had very indepth discussions over the years with Scott, to include making a trip to VDC myself and spending some very valuable time with him. I know of and am aware of some of the weak ares of the Marquee from Scott's point of view, and I fully agree. And the CVA was nevr mentioned. There's a lot that Scott likes about the Marquee. In fact, he likes things so much about it, that he only made a few changes to the original design. One thing I can say for sure from conversations with him, even while at VDC. he's not one for the cap makes huge changes theory. I doubt you'll find a comment or post anywhere where he would support that claim. Here's something else to ponder. It was Scott that really opened my eyes to a lot of my latest improvements. I'm probably his best student on this. Here's a fact based on what has been researched and discovered over the years with a marquee. Of the many caps that are in the Marquee, very few of them actually leak or dry up. The ones that dry up are some tants and the higher voltage electrolytics. And for anyone out there that may doubt this, do a capacitance test for yourself using a cap meter. And when I mentioned to dragen about also doing what he does to help the problem projectors that had my mods, I was also going to suggest some changes other than just caps. My 9500LC Ultra has over 40,000 hours on it. And like I said, the only caps that has been changed in it are a few in the HVPS, LVPS and what I'm doing with the focus board for the 909 coils. Will I eventually change out the other caps - for what? You know I wasn't going to say anything more in this thread but this one I couldn't resist. Really, some of the caps were undersized? Wow that's quite the statement to make coming from a guy with no electronics background. So I guess what you're saying is the guy(s) who designed the Marquee circuits didn't know what they were doing when it came to calculating the size of the caps required to do the job. Naw that couldn't have been the case, maybe it was just that they didn't know there were larger values of caps they could have used in those circuits. Give your head a shake pal! I will stop responding right now if you do, OK?So let me finish on a good note.I SUPPORT WHAT YOU ARE DOING!!!!!!!! You know I wasn't going to say anything more in this thread but this one I couldn't resist.Really, some of the caps were undersized? Wow that's quite the statement to make coming from a guy with no electronics background. Give your head a shake pal! not surprising, same old Walter with the same old crap. Welcome back you old Curmudgeon. I have posted this pic before but let me do so again. these caps in particular are prone to leaking and cause the resistor to burn. Oddly enough my good friend mike parker identified this problem many years ago. The NEW VDC cards use the same cap I install now in machines without the MP cards. There are cases like this one to be found all over the machine. Ok, I'll give this one more try. I've asked for anyone out there who has a good to solid understanding on this to respond to this and help me to understand HOW it is remotely possible for basic cap changes to be made to the boards that you mentioned earlier in this thread to make the changes that you claim, and the only person that did chime in on your defense is Athanasios... So far the only person (macgyver655) I know of that is qualified to chime in has disputed your claim. So let's just sit back and wait for someone to support your claims technically. ? so everyone who agree's with you is "technically capable" and Athanasios is not? Athan has done more to keep these machines running with his brand new LC bellows than your 9 month and a prayer vaporware ever did Mike. Let me be clear what i was saying here. As seen in the quote, thise was related to "PROBLEMS" I WAS getting. And those problems were caused from caps needing replacement in the LVPS and HVPS. No where dii I, ore would I had said anything as to it improving on what I'm doing, because in no way would that be the case.So to be clear, this was referring to cap replacement for those same caps that I had also mentioned in the MM thread. Nothing at all about performance. that's as clear as mud, let me know when you get the final version of this story figured out. Like do you have higher than a grade 3 education or what? You mentioned some caps were undersized, I responded to the undersize statement, not about any caps that may have been leaking. What does leaking caps have to do with undersized cap values? Ahh you're so much fun. Walter if the cap had been rated correctly for the circuit it would not have leaked to the extent of failure that is common on this board I'll let you think about it for a while, Kay? To brings things back down to earth and reality I just want to re-iterate the results so far. 2)100% customer satisfaction with turn around time, typically 10 days door to door. The detractors in this thread can keep pounding away about what is impossible, could never happen, blah, blah , blah, Be my guest. Thats not necessarily true, maybe EH was using some bad caps to begin with or caps which didn't meet the spec they claimed to meet. I'm not familiar with the circuit you're talking about or what demands it places on the caps. I've never seen that happen unless the cap was grossly underrated. Typically caps have about a 20% margin over what they are rated for, so unless the manufacture made a complete out/out lie about the caps specs then okay. Do you know if that particular part only came with one brand/size through out the design run? Again I can't imagine that the EH engineers screwed up that calc. Looking at the 2 different versions of neckboard schematics I have it does show 160V caps and your pics of the leakycaps show 100V caps. Are those boards in your pics from an old version like the 8000? I suppose they could have f--ked up but any designer knows you don't go that close to your supply voltage - 85V and use a 100V cap, interesting. To avoid arguements like this in the future maybe you should be a little more specific about you're referring to rather than making a blanket statement, because you just know someone is going to jump on it. On the Video neck-board they used a Rubycon 100V 85C cap on the +/- 85V rails along with a large 400-Ohm (25 watt?) power resistor in a filter cap configuration. This is the only cap I've ever seen used there starting in 1993 right up to 1999 which is the newest machine i've had here. Both of those rails is also used by the HDM which is a push/pull amplifier operating at moderately high frequncy of up to 100Khz or less in actual use. I believe the HDM imparts a ripple current into those rails which overdrives the 100V VNB caps. This is the phenomenon described in that White paper you ridiculed me for where they explained that a given voltage + ripple current is equivelant to a much higher voltage in terms of operating temperature and leakage rates. Add to this the fact that the marquee neck-board is enclosed in a sheet-metal cage and has some air vectored over it that first passes over the deflection coils and your probably approaching the caps max rated operating temp. anyway. the factory ratings for caps all show that leakage starts to rise drastically as the caps rated temp. is approached. this is one reason why I beleive people with the MP video chain are seeing an improvement. In those cases the VNB cap has already been upgraded by Mike. However, all the additional filtering de-coupling he does is not 100%, IMO it can't be 100% because a filter is just a filter, some crap gets by. The HDM really needs higher quality capacitors with better ripple current ratings to reduce the leakge and switching noise back into the power supply. This is also why people are seeing what is percieved on screen as "better contrast ratio". Both from this board as well as the Vertical deflection module which incidentally shares the 5 and 15 rails with the VNB. the rest of the improvement as discussed earlier comes from applying the same methods to the Convergnece board as well as 3 dozen higher quality resistors to add thermal stability. The result is reduction in judder and noise in the raster. Of course everyone has been jumping up and down hollering about how a better cap can't reduce noise or how their video chain is immune to it or whatever. The only problem is that the actual results seem to show otherwise. That by targeting the noise at the source as opposed to strictly dealing with at the tube is showing a modest level of improvement to the picture quality. That's why I believe the factory caps are underated, if they were sufficient then as has already been blared throughout this thread, a better cap would not yield any results. Lastly, you were wondering why the factory would use cheaper caps. The obvious answer is cost. I work with dozens of engineers, many of which came back to higher ed after an extensive stint in Industry. The universal opinion among them all is nothing they ever put to market was of the quality they designed it to be. What usually happens is a product is designed to a certain spec. and when costs are analyzed the design is thrown back to the desing team to reduce cost and increase the profit margins. I can tell you that even with the limited amount of parts I install, cost is roughly $50. per machine when buying in moderate bulk. Even if the cheaper parts only saved them 50% ( $25. per machine) If they built 10,000 marquee's per year at the height of production that's a quarter million dollars saved on just the focus, delfection, and convergence boards. Now, take those cheaper parts and age them 13 years or more. How can that circuit possibly be anywhere near to it's rated spec's?